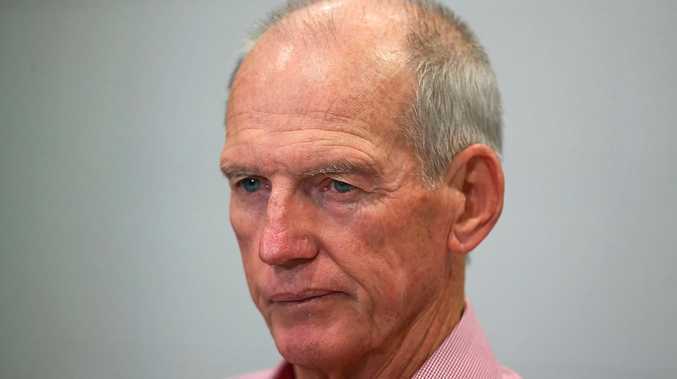 RUGBY LEAGUE: Wayne Bennett has defended his performances with the press in England, saying his position with the national team is coach, not marketer. Under fire for his reticence in interviews during the Four Nations, the veteran Brisbane Broncos mentor has been labelled disrespectful by sections of the media, and accused of failing to promote the sport. But, England is only just discovering what those in Australia have known for some time - Bennett detests dealing with the press. "I started coaching in 1977 and they started bagging me then and nothing's changed in 2016,” he said ahead of England's Four Nations clash with Australia on Sunday night (AEST). "I'll tell you about promoting rugby league. You can talk to any marketing department. They don't want you to be goofing it off and talking it up when your team is getting beat every week because they won't sell a ticket. "My job is to get the best out of those players and give you the best entertainment I possibly can. "What you say away from the game is immaterial. "That has been my philosophy all my coaching life and I am not interested in cheap talk. I am not interested in getting out there thinking I can promote the game by something that I say. Bennett, who has coached England to a narrow loss to New Zealand and a runaway win over Scotland after a slow start, said after almost 40 years of coaching he's become immune to criticism. "I don't read anything you (the media) write any more,” he said. "I haven't for over a decade now. "I watch television shows but when some rugby league comes on I turn it off. Bennett, meanwhile, said he and Mal Meninga, who accused him of being in the "background chipping away, trying to undermine my authority and my position” as Australian coach in a newspaper column had caught up before their teams' clash. "He hasn't said anything to me,” Bennett said. "I saw him yesterday, spent a bit of time with him.